PIBO’s 14th consecutive season of fall migration coverage got underway at Fish Point on August 1st with the 90-minute morning census and some additional standardized observations. The census will be conducted each day until November 15th along with PIBO’s daily six-hour mist netting and bird banding effort, which started on August 15th and will continue to November 1st. It’s a challenge counting songbirds in early August given some of the conditions at the start of the coverage season. Birds are generally quiet in the autumn, many are lying low in July/August during their pre-basic moult cycle, most transition into drab autumn plumage, lots of young birds in the fall are hard to identify, and the forest has leafed-out to its fullest extent. An active, loudly-singing, black-throated green warbler in bright summer colours on a bare branch in April is a completely different matter compared to a silent, cryptic, young Tennessee warbler twenty metres up a densely foliaged tree in August. What’s more, there just aren’t that many birds in the forest during the first three weeks of the month. Many local nesting species and young have dispersed, yet relatively few migrants are on the move. Shorebirds and some early long distance passerines like swallows, kingbirds, orioles, and small numbers of vireos and flycatchers are recorded at the station from the 1st – 20th, along with a few northern waterthrushes and other early warbler species, but nothing compared to the first substantial waves that arrive once the temperature drops and cold fronts begin to develop towards the end of the month. Tack on a range of other workplace hazards – often intense mosquito activity, biting flies, intense heat and humidity, poison ivy, and the like – and it’s no wonder the crew looks forward to September! The start of the coverage season was fairly typical in most respects and so was the bird activity. Small numbers of shorebirds were recorded almost daily from the 1st – 15th – eight spotted sandpipers were noted on August 2nd, along with ones-and-twos of lesser yellowlegs, ruddy turnstone, sanderling, and semipalmated sandpiper seen during the first two weeks of the month. Eleven killdeers were observed on the 13th. A variety of other waterbirds were documented including 350 common terns and 66 Canada geese on the 5th, 1700 double-crested cormorants on the 15th, and, on most days, up to 800 gulls of four species – Bonaparte’s, ring-billed, herring, and great black-backed. American white pelicans are becoming a fixture in the Western Erie basin, with nesting confirmed this summer for the first time. PIBO has effectively monitored this incursion over the last few years from one or two birds sighted in 2014 to almost weekly records this year. Swallows were on the move most days, with six species actively heading south off the tip during the first two weeks of the summary period. Purple martins, barn, and bank swallows dominated, as well as a few northern rough-wing, tree, and cliff swallows. Southerly winds seem to encourage the most active flights, with almost 100 birds of four species noted during the census on August 4th, and 35 barn swallows and smaller groups of others on the 12th, all flying low off the tip into moderate south winds. Other songbird migration was light but there were some early migrants and some species like cedar waxwings observed in good numbers, with 75 individuals recorded on August 9th. The first yellow-bellied flycatcher of the fall was noted that day as well, and the first northern waterthrush on the 11th. While most of the local nesting yellow warblers clear out by late July, groups of migrants were encountered at the tip on a few mornings, including fourteen individuals on August 11th. A small but noticeable change in the weather saw the morning temperature drop from an average of about 24° C during the first two weeks of August to a low of 16 on a few mornings after the 16th. It was still warm and sticky but the constant heat of July and August started to let up. As a result, the initial trickle of migrants early in the month began to increase. New arrivals in the third week of August included black-and-white and blackburnian warbler (August 18th), black-bellied plover and Baird’s sandpiper (21st), and American redstart(22nd). Other species began to appear in increased numbers and over-all diversity picked up. Forty-three species were documented during the standardized coverage period on August 19th, for instance, compared to an average daily species count of thirty during the first fifteen days of the month. While not related to this month’s summary, PIBO learned from the Canadian Bird Banding office in mid-August that a bird banded at Fish Point last September was relocated this July, ten months later, in Alaska! The Swainson’s thrush in all likelihood migrated south from Ontario last fall, overwintered as far away as Argentina, then traveled to Alaska this spring. In this scenario, and if the bird spent the winter in the most southerly part of its range, this 30 gram thrush (the weight of four Loonie coins) will have traveled up to 18-20,000 km in just under ten months, or an average of 2000km a month! There’s just one similar record, a near mirror image, in the Canadian Atlas of Bird Banding for the period 1921 – 1995, of an individual banded at Prince Edward Point, Ontario, in October 1977, that showed up in College, Alaska, almost exactly one year later. Otherwise, barring a similar banding/re-encounter event during the period 1996 – 2016, these are the only two records of any Catharus thrushes (Veery, Swainson’s, Graycheeked, and Hermit) recorded in Canada that have appeared in Ontario (or elsewhere in Eastern North America) as well as the Western Pacific states or provinces. 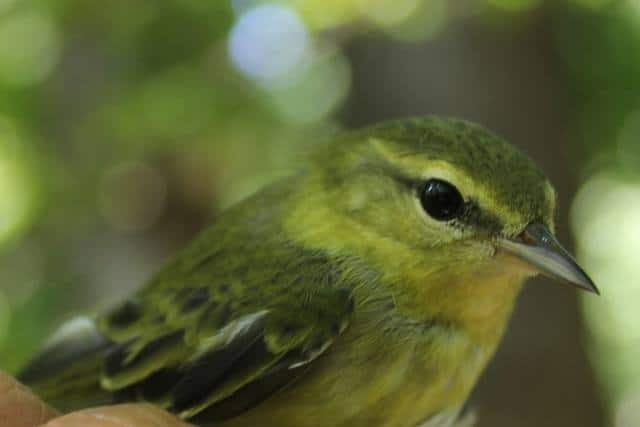 While the netting operation remained fairly quiet – 130 birds were captured from August 16th to the 31st – the first significant pulse of autumnal migrants reached Pelee’s shores on the 26th of August and continued fairly steadily to the end of the month. The lead-up included a number of new arrivals on the 23rd – 25th including bay-breasted warbler, an early but not unusual yellow-rumped, a banded golden-winged warbler, and the first Swainson’s thrushes and veerys. Twenty-five birds were captured on the 24th including 11 American redstarts. While the temperature remained above normal, some north winds on the evening of August 26th made for the most active morning at the station to-date. Fifty-nine species were noted on the 27th including ten warbler species and fall-firsts for solitary sandpiper, red-breasted nuthatch, Philadelphia vireo, and Cape May warbler. The first willets and scarlet tanagers appeared on the 28th, followed by firsts the next day for yellow-throated vireo and a banded orange crowned warbler. The surge continued when 61 species were recorded on August 30th. A wonderful variety of birds were noted from pelicans and soras to screech owls and grosbeaks, along with a banded Connecticut warbler among a total of fourteen warbler species on the day. In all, 130 birds of thirty-one species were captured in August and 128 species were recorded at Fish Point during PIBO’s official coverage period. While banding results can fluctuate markedly from year to year, these totals fall in line with the observatory’s long-term records for August. PIBO’s next summary will be posted on September 17th.